Clipper Chamomile Infusion is made with certified organic chamomile flowers. 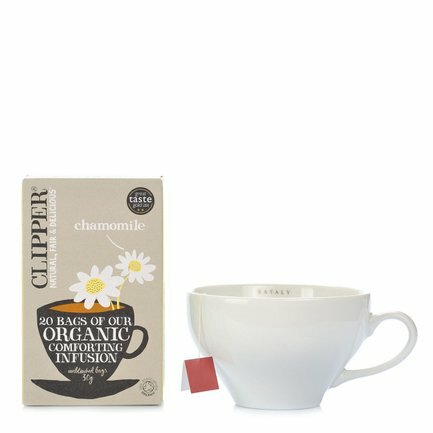 Its sunny golden colour and unmistakably delicate chamomile perfume offers an immediate sensation of calm. Naturally caffeine-free, it is the perfect drink for relaxing after a hard day. Leave the bag to infuse for 2 to 5 minutes and sweeten to taste. Ingredients chamomile flowers* (Matricaria chamomilla L.) For more information on product labels, please contact our Customer Service department. The information on the labels of the products may vary for reasons beyond our control, therefore, there may be discrepancies between the information on the site and that on the products delivered. Please always check the information on the product before consumption or use.